Home / 4 Star Cottage Rutland / The Osprey have returned to Rutland Water! 14 Mar, 19 / 4 Star Cottage Rutland, Dog Friendly Cottage Rutland, Puddle Cottage, Rutland Birdwatching, Rutland Nature Reserve, Rutland Water / Anna Bath / Comments Off on The Osprey have returned to Rutland Water! It’s been a busy day on Rutland Water. The Ospreys have started to return back to the area and seem to have settled well! Great news! 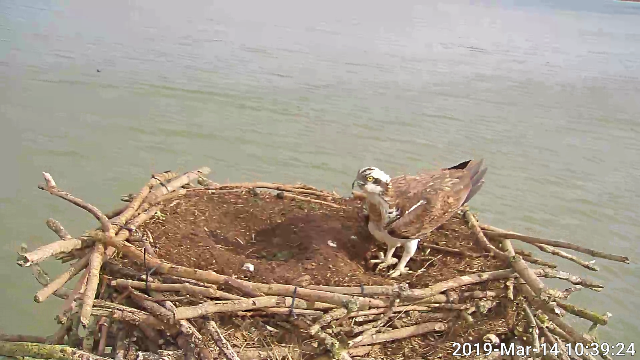 Maya arrived back on the nest at 10.39 this morning (14th March), 2 days later than in 2018. She battled wind speeds of up to 50mph to reach Manton Bay, and was only on the nest for a few minutes before disappearing again, presumably to find herself a well earnt meal. Hopefully Spring is just around the corner now! If you are planning to visit Rutland Water to see the Ospreys, why not stay at Puddle Cottage? We have availability over the next few weeks, and can offer anything from a short 3 night break to a week’s stay. The cottage is a 4 star self catering cottage located in the charming village of Edith Weston and is just a short walk to the South shore of Rutland Water. Rutland Water Nature Reserve and Anglian Water Bird Watching Centre are only a few miles away. To book please contact Anna on enquiries@puddle-cottage.co.uk or call 07734175291. We would be delighted to welcome you to the area.